This Stacked Caprese Salad combines all the flavors of classic caprese salad, but stacking it makes it easy to serve and eat! 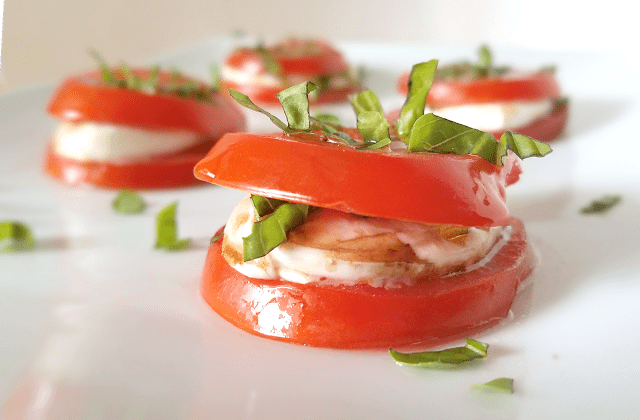 Perfect as an appetizer at your next party or even as a side dish or light lunch, this Stacked Caprese Salad is low-carb and full of flavor. I meant to share this recipe earlier – like, in tomato season – but life got so busy this summer that I’m just now getting a chance. Even though it’s late, it’s totally worth the wait! So harvest the last of your tomatoes from your garden, because you have an awesome tomato recipe to make! This recipe is so versatile that it can be dressed up on down. It would make a delicious snack, lunch or side dish, but it would also make an impressive and delicious appetizer for a party. 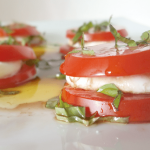 Versatility is one of the many wonderful things about caprese salad! The magical combination of simple flavors is another wonderful thing about caprese salad, and admittedly one of my favorites. 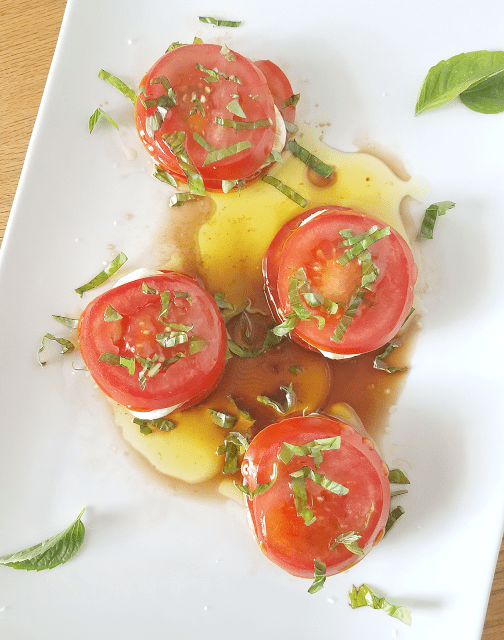 I just love the flavors of fresh basil, tomatoes and balsamic vinegar! However, I find that the classic presentations of caprese salad make it a bit difficult to eat. Don’t get me wrong, the classic presentations are beautiful and I’ve done them many times. I just find the spread of layers and whole leaves of basil difficult to serve and to eat. Luckily I’m a problem solver, so this Stacked Caprese Salad was created with solutions in mind! By stacking the Caprese Salad, I’ve made it super easy to serve and eat. 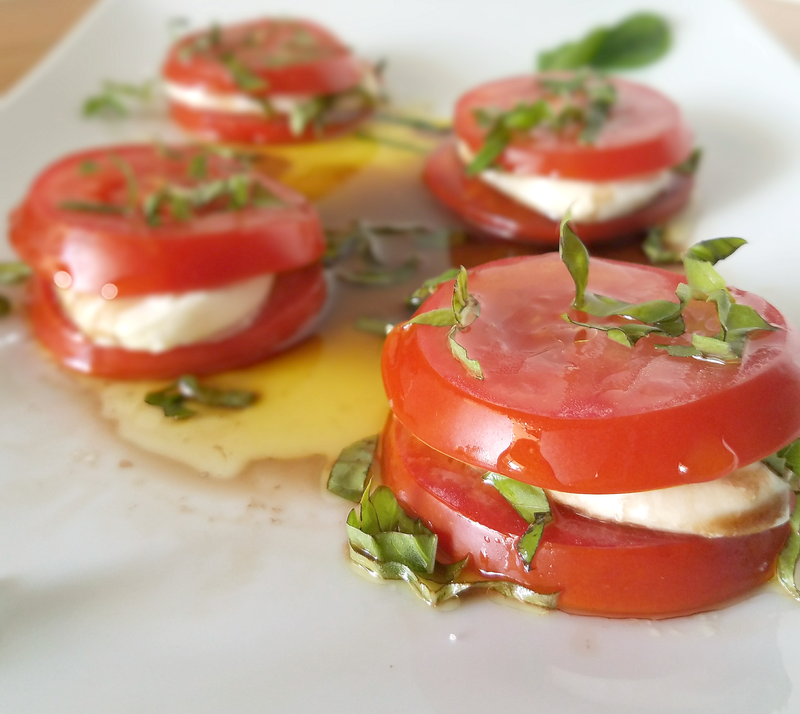 Each person can take however many stacks they want, and each bite will contain all of the flavors that make caprese salad so amazing, with a tomato-to-mozzarella ratio that I’ve found to be ideal. 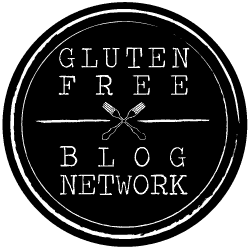 And, this recipe can be enjoyed by a wide variety of people since it’s gluten-free, grain-free, egg-free, nut-free, low-carb and keto friendly! Whether you are looking for a delicious side dish to use the fresh tomatoes in your garden or needing an appetizer that will impress your guests, here it is! 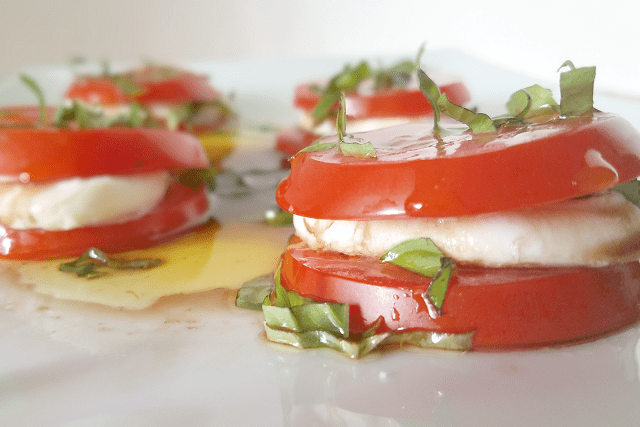 Not only is this Stacked Caprese Salad delicious, beautiful, and easy to make and eat, pretty much all of the ingredients are good for you! Tomatoes have been studied extensively for their health benefits. Not only do they contain potassium, vitamin C and carotenoids that the body can turn into vitamin A, tomatoes are rich in antioxidants. Lycopene, which is found in large amounts in tomatoes, may help keep the heart healthy and fight cancer (source). Click here for a comprehensive article on the health benefits of tomatoes. Basil is small but mighty, providing vitamin K, vitamin A, manganese and magnesium (source). It also contains antioxidants and volatile oils that research has shown provide anti-inflammatory, antibacterial and antioxidant properties (source). Mozzarella is made from milk, so it provides the protein, calcium, and vitamin A typical of dairy products. Olive Oil has also been studied extensively and is almost universally considered a healthy oil. It’s rich in both monounsaturated fats and antioxidants, and research has repeatedly shown that olive oil can help reduce inflammation, protect the heart, and maybe even protect against cancer (source). 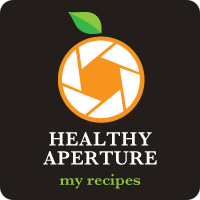 All amounts listed in the ingredients below are approximate. One of the best things about this salad is that it can be tailored to your personal tastes! If you love fresh basil, add more. Change the amount of salt, olive oil and/or balsamic vinegar, if desired. 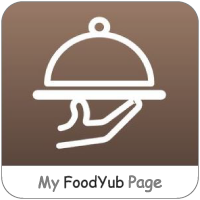 This salad can be made to fit your personal preferences. I prefer to use vine ripened or beefsteak tomatoes instead of roma tomatoes. I also prefer to purchase pre-sliced mozzarella, but you can certainly slice your own if you prefer or if you cannot find pre-sliced mozzarella at your local grocery store. Just be sure to use fresh mozzarella! It’s easy to distinguish from low-moisture mozzarella because fresh mozzarella is always sealed in a package with liquid (water, whey or brine). Good olive oil is essential, but let’s face it: quality olive oil is expensive! I buy my olive oil at Costco. 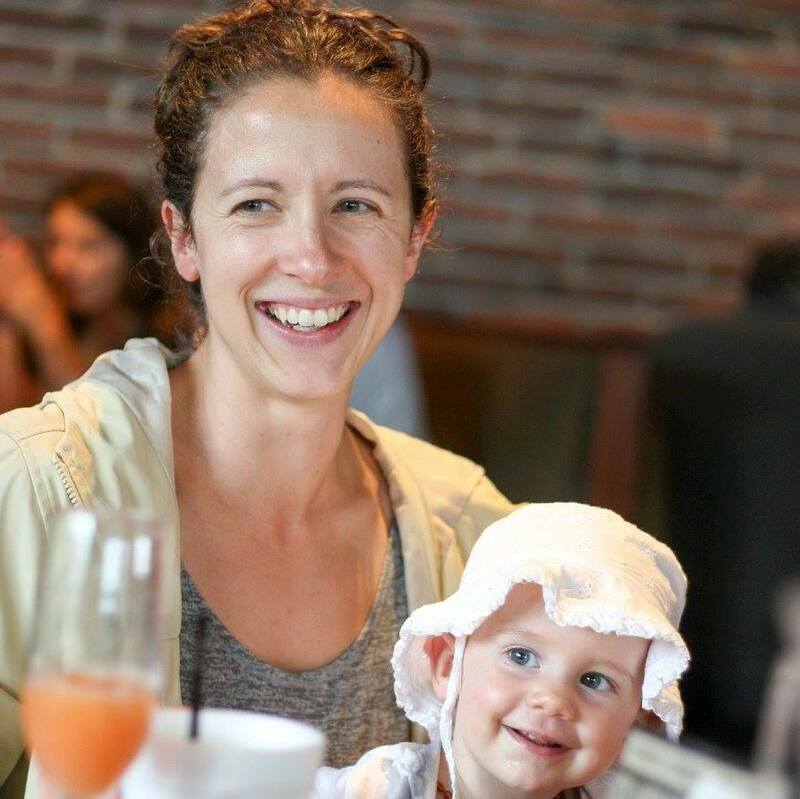 Check out my post on 30 Organic Pantry Items to Buy at Costco for more information. A good knife is important, especially when you are slicing tomatoes! I have owned J.A. Henckles knives for years and love them. My choice for slicing tomatoes is my 7-inch santoku hollow edge knife, but any of them would work. Check out the video below to see how to make this Stacked Caprese Salad and then scroll down for the complete recipe! Slice the tomatoes into 1/4 - 1/2 inch pieces and sliver the basil. 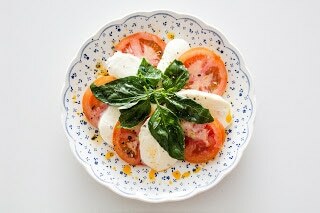 If not using pre-sliced mozzarella, slice it in 1/4 - 1/2 inch pieces (to match the tomatoes). Arrange a layer of tomatoes on a platter. Drizzle with half of the olive oil (2 Tbsp) and sprinkle with half of the salt (1/8 tsp) and one third of the slivered basil (1-2 Tbsp). Lay a slice of mozzarella on top of each tomato slice. Drizzle with the balsamic vinegar and sprinkle with another tablespoon or so of slivered basil. Place the last slice of tomato on top of each slice of mozzarella. Drizzle with the other half of the olive oil and sprinkle with the remaining salt and basil.